Whether the holidays are here or a special someone’s birthday is just around the corner, finding the perfect gift for a discerning gentleman is no easy task, especially if they happen to be someone near and dear. You could go with something in the lines of a bottle of whiskey or a good wine, but while this will be much appreciated, it will also be easily forgotten. It’s a quick fix that you can’t possibly wrap as anything else, since these don’t say much as gifts; unless, of course, they are vintage purchases, which changes everything. There’s always the odd sweater, pair of socks, or scarf. Unlike alcohol, these require a bit more effort, so they’ll likely be received with more fondness. If you also happen to know favourite styles, colours, and/or patterns, you’ll definitely manage to get by with a good pick out of these three. But let’s say you want to make an impression or send a clear message to a dashing, refined man. In these situations, none of the above will do. Instead, you’ll need a well-thought gift that will deliver your affection straight to their soft spot. Although men are often creatures of habit, they do relish their share of adventure. At any rate, we clearly enjoy the idea of exploration, even if mapping new worlds might not be something we get to do every day. Nothing combines habit and novelty as haute perfumerie does. Naturally, you may not have the time or resources to order a special, hand-crafted fragrance (although this would be the ultimate compliment), but a sophisticated combination of scents will elicit a similar reaction. Every man has had their fair share of cologne, so choosing a different eau de toilette might actually cause repulsion. My advice is – don’t go with this gift. A well-chosen perfume, on the other hand, will make them hold you in high esteem. Yves Saint Laurent’s collection (Intense, La Nuit, and Ultime) is a good starting point, while Dior’s Sauvage, and Paco Rabane’s 1 Million are just as appreciated. I wouldn’t necessarily go for a particular brand, but rather try to figure out their flavour profile and narrow the choices from there. Do they fancy oriental fragrances such as mandarin, patchouli, and cardamom? Do they have a penchant for explosive citrus or a propensity for woody aromas such as cedar and vetiver? Answering these questions will help you land on the perfect choice. Without a doubt, the wristwatch is one of those accessories men feel most attached to. There are thousands of articles written about men’s obsession with chronographs and, although not everyone shares the same degree of infatuation, we sure tend to love our timekeepers. If chosen with great care and attention, a pre-owned luxury watch will not only be an enduring gift, but also a highly significant one. From improving one’s professional appearance to boosting their confidence and asserting some of their values, refined gentlemen tend to develop more meaningful relationships with the accessories they love, as the latter reflect more of who they are or desire to be. Although you might feel apprehensive at the idea of a pre-owned gift, this is actually the result of nothing more than prejudice. The pre-owned luxury watch market has grown substantially as of late, since the prices make these bespoke accessories more affordable. More importantly, a great number of luxury watches are kept in amazing condition. Whatever you do, though, don’t buy a pre owned Rolex off some random person’s ad on the web. Instead, try to find a reputable dealer such as Watches Of Wales - who can guarantee authenticity, service, and a has a legal return policy. 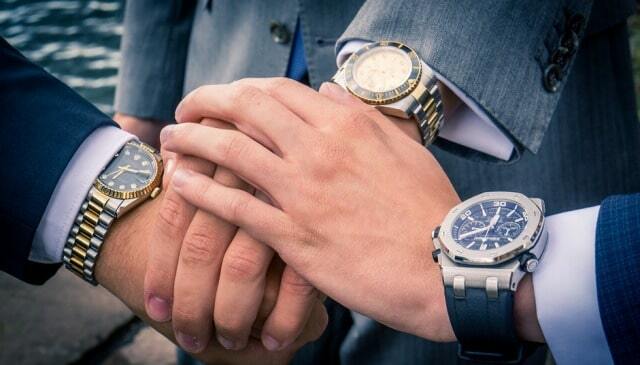 Then, feel free to ask some of his close friends whether he prefers Tudor, Rolex, Omega, or Panerai Luminor. Last, but certainly not least, because a discerning gentleman always dresses the part, their accessories will undoubtedly follow suit. In case you don’t fancy either of the two previous options, a set of cufflinks, tie bars (slides), and pocket squares make for a perfect and thoughtful present. The goal of jewellery is to complement the wearer’s appearance and having a matching set of these three accessories will provide them with an aesthetic edge regardless of what type or colour suit they’re wearing. Don’t aim for anything too flashy and try to pick between colours that would complement a wide selection of nuances. Knot cufflinks made of sterling silver with platinum plating will ensure practical use, as well as visual impact. In terms of pocket squares, silk-coloured pastel is a sure bet. If you want to go the extra mile, you can order hand-carved cufflinks and tie slides directly from manufacturers. Although slightly more expensive, this makes it possible to engrave and personalize them to suit your special gent. Few things will make him feel as appreciated as a pair of these! It can be difficult to narrow down your choice of gift for a special, discerning gentleman. Whether they’re part of your family, a special someone you care about, or a don you want to send a clear message to, either of these three gifts will help you come out on top. This is not to say that they are fool-proof. All men have had their fair share of receiving a gift they already own or something they clearly disagree with. However, these situations can easily be avoided with a bit of foresight. Before starting to browse, try to list their qualities, preferences, habits, likes, and dislikes. Then, think of what you have already seen them wear or whether they’ve spoken fondly about something they wish to own. After all, the best gift is the one that gives them the most pleasure, so you’ll find that, more often than not, the answer lies with them. As a last resort or a way to confirm a bigger engagement on your part, you can ask the opinion of one or more of their best friends. Just make sure that none of them are the tattler kind or your gift won’t be much of a surprise! I hope you enjoyed this blog post about awesome gift ideas for the discerning gentleman of sophisticated taste and style. Interested in more articles about great gifts to give in business?